When I was pulling together my Cinco de Mayo menu, I wanted to include one of my favorites– churros–but I wasn’t about to make them from scratch. 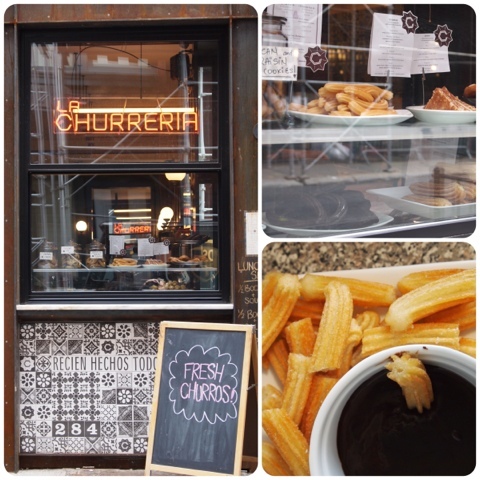 So, after a quick google search, I headed down to my old neighborhood on Mulberry Street in Nolita to La Churreria. (note to my single friends) Upon entering this adorable cafe/churro stand, Icouldn’t help but feel like this would make for a great late-night date spot to grab a warm churro and hot chocolate. Back to the task at hand, I ordered 20 original churros and a large container of the hot dipping chocolate for $15. They have that perfect balance of dough, fried goodness, and sugar. 20 were purchased, but only 18 made it home, and it is a miracle I didn’t eat them all. I placed them in the fridge overnight until it was time to reheat. 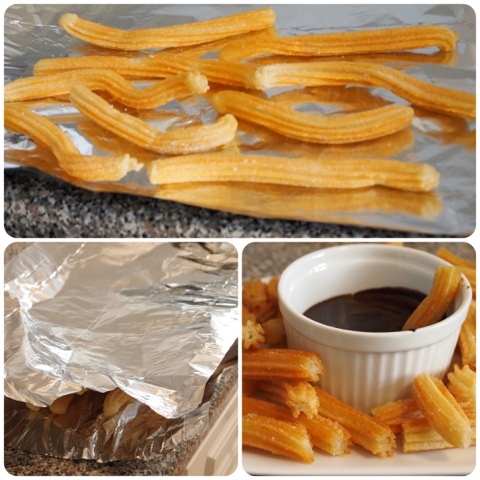 – Place churros on a large piece of aluminum foil. – Take churros out of oven and cut into 2 inch pieces using kitchen scissors.